Sam of Sam Vander Wielen LLC is co-hosting the January 2018 edition of #WellstruckLadyBoss at Vault + Vine in Philadelphia. We're sharing a few Q&As with her so you can get to know this fellow boss! A: Sam Vander Wielen LLC is a DIY legal template and business mentorship company for fearless entrepreneurs who want to create businesses and content they truly love. I'm an attorney-turned-entrepreneur who empowers women to break through the fear tactics, inaccessibility, and confusion around legal for small businesses. I offer fill-in-the-blank style legal templates like contracts, policies, website documents and more, that are tailored for women entrepreneurs and which each come with their own video How-To Tutorial. It's really important to me we approach legal from a more positive mindset. Instead of only wanting to tackle legal in your business because you're afraid to be sued, let's approach it from a more proactive mindset. How about making your business look more legitimate and professional? Making clients understand clearly what they've agreed to pay you and what they're going to receive? How about protecting your amazing content you've worked so hard to create? A: Well, first and foremost, I'm proud of my clients! I work with so many women who are at different stages of their businesses! But through a little legal confidence boost, they go on to either start the business, create their first course, or finally start taking on 1-on-1 clients. It's amazing to watch! And I'm happy to play a tiny part in their journey. On a more personal level, I feel proud of the fact that I'm offering an alternative legal option for women that's accessible, easy, and that actually understands what they do. Being a corporate attorney was eye opening. It's still very much an old boys club, and women — let alone women with their own businesses — aren't always welcome. A: Getting to help women develop or grow their own business, which is going to afford them freedom (both financial and otherwise), creativity, and fulfillment. I realize now that I had to leave the law because that's what I was seeking — freedom, creativity and fulfillment. But as soon as I got into the world of online business or entrepreneurship, I realized there wasn't enough (or any?) help or resources out there for women like me who didn't have a lawyer-background. And since I was an attorney at a law firm, I knew law firms weren't exactly the answer either. The fact that anyone would be held back from starting their own business, or moving theirs forward, because they were confused over some basic legal steps broke my heart. With just a little bit of information, these overly complicated issues are set straight and you can be on your way to freedom. A: Whether you're just starting out, or you've been in business for a while, keep your heart and mind open to change. We don't need to put so much pressure on ourselves for our businesses to be right or perfect — now or ever. They might never be perfect! Actually I can pretty much guarantee it won't. Oh, and one more tip! Have the courage to say "this isn't working for me, I'm going to do something else/make a change/stop doing this/etc." For one, other people probably won't even notice since they're off doing their own thing. And you constantly need to do what's best for your business and most in alignment with your soul. 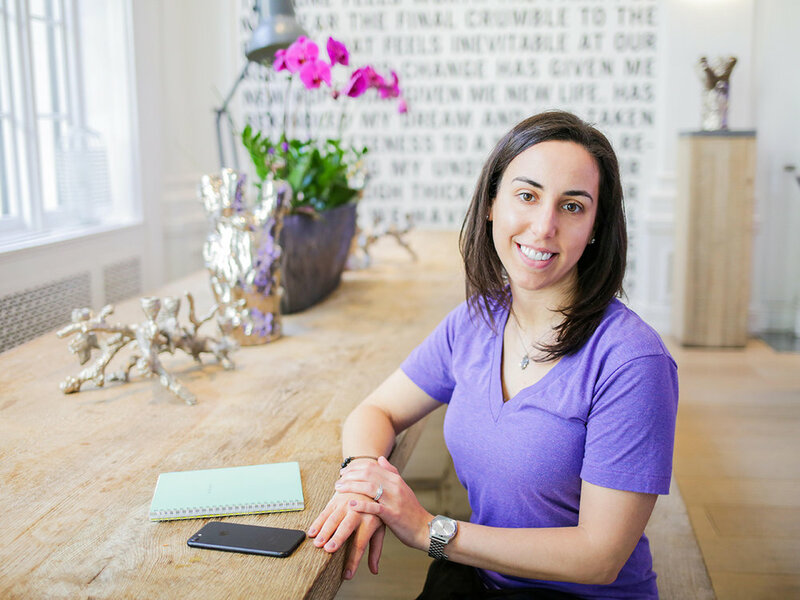 When I first left the law firm, I actually started a totally different business (a health coaching company). It was only because I was open to pivoting that I saw I had another business blossoming right in front of me. At first, I felt like my first business had failed since I chose not to pursue it any more. But now I see it totally differently. It was the right thing for me to do, both personally and professionally, and I feel so much more in alignment with what I'm doing (and I think it shows!). A: Canva, Calendly, and Screencast-o-Matic (for recording my legal template video tutorials). A: One Part Plant Podcast, Goal Digger Podcast, and everything on Spotify. Q: What bosses are you crushing on? A: Libby Crow, Simi Botic, Cameron Simcik, and Paige Schmidt. Q: What inspirational words resonate with you recently? A: "Stay in your own lane" and "empowered women empower women." A: My website! And I'm @SamVanderWielen on Instagram. The January 2018 edition is especially for owners of service-based businesses. If this sounds like you and you'd like to meet more women entrepreneurs in a laid-back, intimate roundtable discussion atmosphere — join us!